Is Virgin Media's speedy service the future? 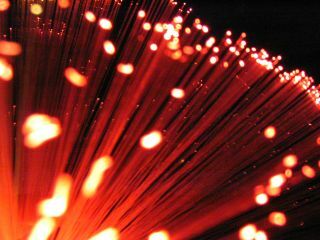 Fibre optice - the future of the internet? by the end of 2010, the argument is sure to rage over how ready the UK is for a service of this kind. TechRadar editor Patrick Goss has been using Virgin Media's 50Mbps service for the past year, and he outlines his impressions of an offering that is about to lose its place as the flagship cable broadband package. A few months after Virgin Media had installed a 50Mbps connection in my house a partner in Deloitte told the Intellect conference that superfast broadband was a waste of time. "Why bother with tens of megabits per second," he asked, "when you can watch the iPlayer with just 2Mbps?" But even after just a few short months with a fast connection I felt compelled to disagree. It may be an expensive option at the moment, but it doesn't take a genius to come to the conclusion that superfast broadband is very much the future. I had been less convinced when I had signed up for the service; I wasn't sure if I even needed a 50 meg line, but was finally convinced to give it a go and see if it made any difference to my life. Of course, like everyone with a fast internet connection, my first check on being handed the keys to my superfast new kingdom was a speedchecker. And the next use my connection got was to Google the question 'why am I not getting 50Mb connection?'. I was well aware that, not only are online speedcheckers patchy on superfast packages, but that a myriad of other factors could influence my connection, so got on with what I would consider the best possible test of the 50Mb connection. Rather than spend every day checking the speed, something that has precious little real-world value beyond numbers, I simply lived with it. Gaming, surfing, multiple computers, big downloads, small downloads, phone updates, a move to Windows 7, outages, phone connection issues, I put my connection through a reality test. Could it deal with my connected household? And the answer was indisputably yes.